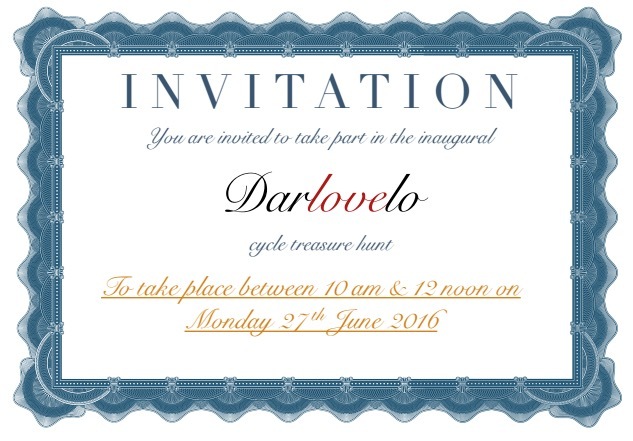 Darlovelo, in conjunction with Bike Stop, is organising a Cycle Treasure Hunt on 27th June to help inform local decision makers about the good and the bad for everyday cycling in the town. Councillors and officers from Darlington Borough Council, as well as a representative of the town’s fire service, are being being invited to join a small group of local cyclists on a series of typical everyday cycle journeys – going to school, shopping, calling in at a café and so on. The ride, which will take no more than two hours, kicks off at 10am from BikeStop in Skinnergate. If you are a local cyclist and would like to help out with the event, drop us an email for more details. Is Road Crime Really a Crime? Do the police in Darlington treat road crime as real crime? Or do they treat the danger vulnerable road users face as none of their business? 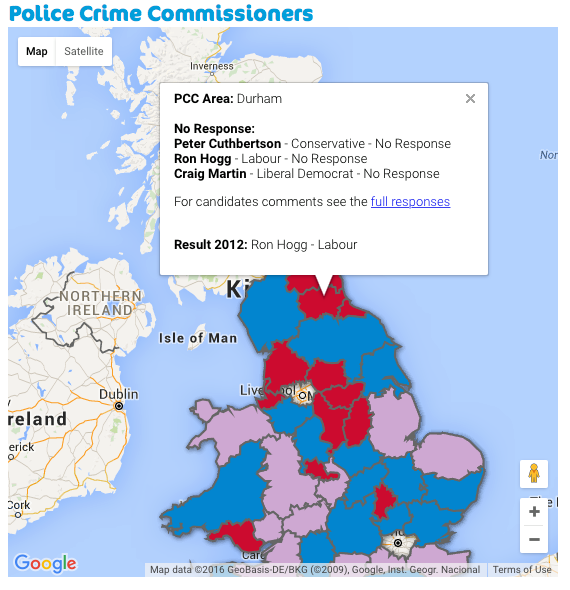 Cycling UK asked the candidates for PCC in our area to commit to a minimum staffing of road policing units and an increase in the road policing budget. None of the candidates have replied. Please use and share the link below to ask the people who are asking for your vote what they will do to treat road crime seriously. In a Royal College of Physicians report published this week, doctors have urged people to cycle to save deaths from motor-pollution. develop ‘islands’ of space away from traffic, for safer walking and cycling. Darlovelo this week highlighted the cost to Darlington of air pollution caused by motor traffic. In an article in the Northern Echo, and using Department of Health figures, we calculated the number of deaths in 2014, directly attributable to man made air pollution, and the results are frightening. We estimate there were 40 deaths in Darlington caused by air pollution, that’s one every 6 days. The same calculations show that the North East has seen 1,009 people die in 2014 due to the dirty air we breath every day, a staggering one person every 8 hours. Figures for deaths caused by air pollution are taken from the Clean Air in Cities app. People who own a car know the instant convenience of being able to jump into their private form of transport. Car owners feel protected from the elements and other people. It can be easy to ignore the hidden costs that accompany a country dominated by private motor traffic. 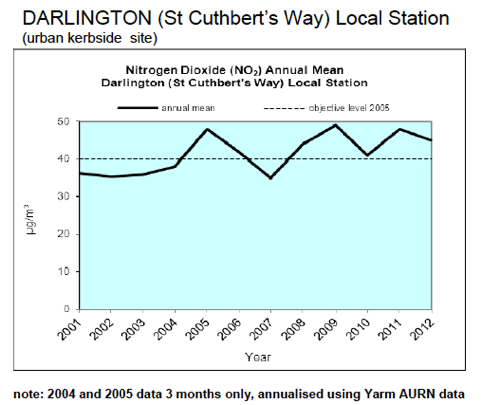 Air pollution levels exceeded target levels in Darlington Town centre (2013 Air Quality Progress Report for Darlington p18). These figures show the cost of loving our cars too much, such as the death toll from air pollution. These very small particles, far too small to see with the naked eye, are generated by all engines, but especially by diesel engines. Particularly dangerous are particles of 2.5 microns in diameter (a micron is one-millionth of a meter) referred to as PM2.5. Other pollutants from engines include NOx (nitrogen oxides). These gases dissolves in the lining of the lung causing bronchitis and emphysema. Darlington Borough Council’s own report admits that ‘Road traffic fuel and exhaust emissions remain the largest source of air pollution’. This confirms that the way to tackle the dirty air in Darlington is by providing the infrastructure needed to get people out of their cars and taking sustainable transport such as walking and cycling. The danger to public health from air pollution is in addition to the tragic results of traffic collisions. These can be seen all to frequently in our local and national newspapers. Serious road collisions where pedestrians and cyclists are victim are on the rise. Calculations from the Department of Transport show that these traffic collisions cost Darlington residents £16.4 million per year. To this can be added the cost of inactive lifestyles caused by car dependency. Not taking enough exercise leads to a wide range of health conditions and the cost to Darlington of sedentary lifestyles is £23.7 million per year. Darlovelo is calling on Darlington Council to install segregated cycle lanes on busy roads, protection for cyclists at junctions and slower speed limits on residential roads. The AGM will be followed by a buffet provided by Clervaux Café, and drinks provided by Darlovelo members and supporters. The buffet will be free for all Darlovelo members, and £10 for non-members. If you are not a current member, you can join Darlovelo at the door for £5 or online. Please bring along your favourite beverage (non-alcoholic drinks can be purchased from the café). Clervaux will be happy to open and serve it! WE NEED TO CONFIRM BUFFET NUMBERS!